In Iran it is typical to prepare this dish when it is wash day. The traditional way to make this meal is very early in the morning you make a fire in a large rock-lined pit outside the house. A large covered kettle is filled with the ingredients and placed over the coals to cook slowly all day. At the end of a day of doing laundry the food was ready with minimal preparation. 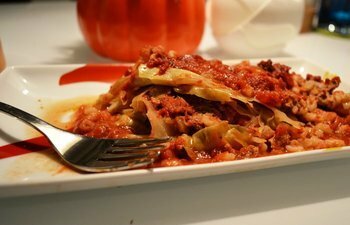 This slow cooking recipe lends itself beautifully to a slow cooker and I have also simplified by substituting cooked, canned beans for dried ones. 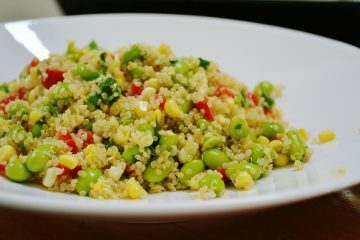 It is served strained through a slotted spoon and scooped into pita bread but I like to spoon it over a whole grain like couscous, quinoa or rice. 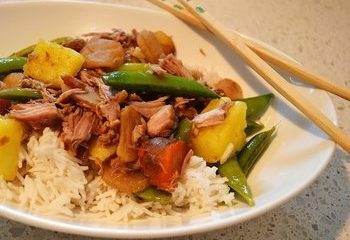 I adapted this Chinese-influenced slow cooker recipe from a recipe I found while perusing a Filipino food site. It originally called for boiling the ribs in water until they were tender and then tossing them with the black bean sauce in a skillet. I wanted something a bit more hands-off as far as the time spent cooking the ribs, as well as I preferred braising the ribs in an Asian braising liquid to impart some flavor to the ribs while they cooked. 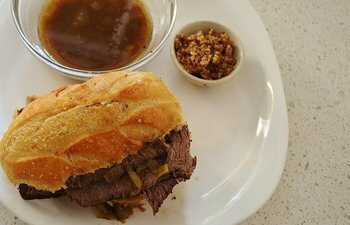 The slow cooker was the perfect cooking tool to achieve this. Most of the time for this recipe is invested in the slow cooker, but you’ll need an additional 10-15 minutes in prep and preparing the black bean sauce to toss with the fall-off-the-bone ribs. I served this at a dinner party and we could not get enough of this slightly exotic Chinese dish; most of us going back for another serving. I served it over steaming white jasmine rice along with a vinegar-based cucumber salad and one of my favorite Filipino noodle dishes, Pancit (find this recipe on The Whole Meal’s website). 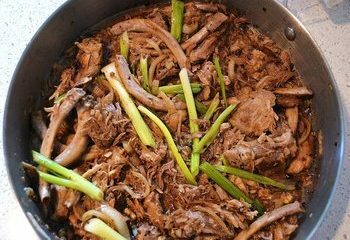 If you would like to treat your family and friends with something different than typical Chinese/Asian cuisine, I highly recommend you prepare this meal with the Pancit. Finish it off with fresh lychees if you can find them at your local farmer’s or Asian markets. 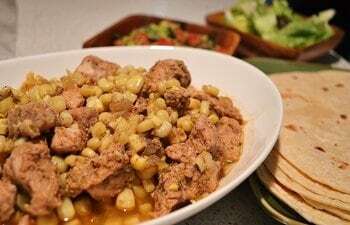 Many Mexican dishes are perfect for the slow cooker as they require braising or roasting of meats, which adapt very well to crock pot cooking. 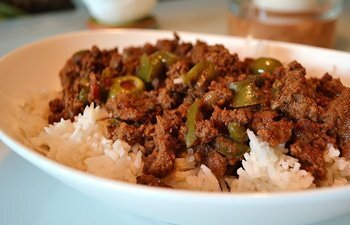 I have yet to make this the traditional way, but if the slow cooker is any indication, this is a nice addition to your Mexican recipes. Traditionally eaten during the Christmas season, I find this soup/stew adapts easily to warm weather due to its cooling condiments. 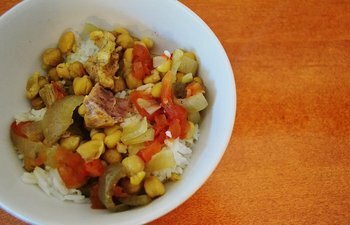 I have replaced the traditional hominy with fresh corn which makes it even more appealing in warmer weather. 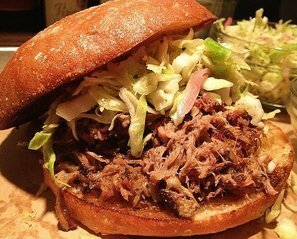 Quick and easy pulled pork sandwiches are the perfect come home to meal on those really busy weeknights. It’s as easy as adding a heap of store bought coleslaw (my favorite is Whole Foods) on top of this vinegar-based BBQ or put out some baby carrots and celery sticks for a fast veggie side. I may never make a stir fry again! 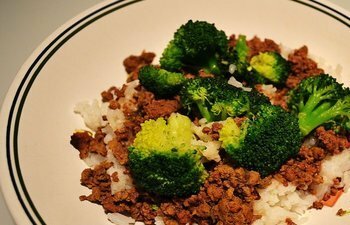 This crock pot version, which is adapted from a Better Homes and Garden recipe, was so easy and the results so flavorful that I am ready to discover other stir fry versions I can convert to a crock pot.